There is obviously need for separate discussion about Macedonians.... who were ancient Macedonians...who are Macedonians of today? Proof? because I can prove that they were bulgarians before WW2. There were macedonian dynasties during the eastern roman empire (Byzantine), like Basil the second, which fought and won against who they call their ansestors, czar samuel ect. In all reality, this dispute isn't about what they call themselves, it's the territorial claims they make based on their imagined community. This is why Greece doesn't mind they use the term 'macedonia', as long as the is a prefix, like northern, Upper, New Macedonia ect, which distinuishes itself from the greek Macedonia. Bulgaria feels the same way and back greece on this. "Competing claims to Macedonia put foward by Serbia, Bulgaria, and Greece, led to the outbreak of the balkan wars in 1912. Wach state attempted to legitimate its territorial claims with arguments concerning the naitonal consciousness, ethnic identity, linguistic affiliation, and religious loyalty of the inhabitants of the area." "With the establishment of an independant Bulagrian church knows as the Exarchate in 1870, Greece and Bulgaria began to compete openly for the loyalties of the slavic-speaking population of Macedonia, who had either a greek or a bulgarian national consciousness." "The interwar Serbian (and later Yugoslav) government attempted quite unseccessfully to "serbianize" the slavs of Yugoslav Macedonia, who generally defined themselves as bulgarian." "During World War two, Tito and the leaders of the Yugoslav communist Party adopted a new policy toward teh slavs of Macedonia. They decided to create a new nationality, the 'macedonian' nationality and they established the ;Peoples republic of Macedonia" in what had previously been known as 'southern serbia' or 'the vardar Banovina'. It was at this time that the name "macedonian" first began to be used to denote a specific ethnic or national group"
If you don't trust this source for whatever reason there is teh Turkish Millet system of governance you could take a look at. In total 1,300,000 Christians (almost exclusively Orthodox), 800,000 Muslims, 75,000 Jews, a total population of ca. 2,200,000 for the whole of Macedonia. My conclusion, to think this "name dispute" is about the ancient macedonians is partly false. This is about the events that happened form teh balkan war until today. The anceint macedonians were draged into this dispute because they were the originators of the name macedonian. Independent sources in Europe between 1878 and 1918 generally tended to view the Slavic population of Macedonia in two ways: as Bulgarians and as Macedonian Slavs. German scholar Gustav Weigand was one of the most prominent representatives of the first trend with the books Ethnography of Macedonia (1924, written 1919) and partially with The Aromanians (1905). The author described all ethnic groups living in Macedonia, showed empirically the close connection between the western Bulgarian dialects and the Macedonian dialects and defined the latter as Bulgarian. The International Commission constituted by the Carnegie Endowment for International Peace in 1913 to inquire into causes and conduct of the Balkan Wars also talked about the Slavs of Macedonia as about Bulgarians in its report published in 1914. The Commission had eight members from Great Britain, France, Austria-Hungary, Germany, Russia and the United States. Ethnic groups in the Balkans and Asia Minor as of the early 20th Century (William R. Shepherd, Historical Atlas, 1911). Distribution of races in the Balkan Peninsula and Asia Minor in 1922, Racial Map Of Europe by Hammond & Co.
Ethnographical Map of Central and Southeastern Europe - The War Office, 1916, London. as a distinct group of Slavs different from both Serbs and Bulgarians having no developed national consciousness and no fast ethnical and political affinities (the definition of Cvijic). An instance of the use of the first meaning of the term was, for example, the ethnographic map of the Slavic peoples published in (1890) by Russian scholar Zarjanko, which identified the Slavs of Macedonia as Bulgarians. Following an official protest from Serbia the map was later reprinted identifying them under the politically correct name "Macedonian Slavs". The term was used in a completely different sense by British journalist Henry Brailsford in Macedonia, its races and their future (1906). The book contains Brailford's impressions from a five-month stay in Macedonia shortly after the suppression of the Ilinden Uprising and represents an ethnographic report. Brailford defines the dialect of Macedonia as neither Serbian, nor Bulgarian, yet closer to the second one. An opinion is delivered that any Slavic nation could "win" Macedonia if it is to use the needed tact and resources, yet it is claimed that the Bulgarians have already done that. Brailsford uses synonymously the terms "Macedonian Slavs" and "Bulgarians", the "Slavic language" and the "Bulgarian language". The chapter on the Macedonians Slavs/the Bulgarians is titled the "Bulgarian movement", the IMRO activists are called "Bulgarophile Macedonians". imagine that you are Greek who lives in Turkey and your Greek sounds Turkish... in my viewpoint that does not stop you to see yourself as Greek... I can listen to your good Turkish and bad Greek and claim you are Turk, but if you see yourself as Greek, than you are Greek no matter what anyone else thinks..right? same is here... Macedonia was occupied by Bulgarians in big part of early medieval period.. naturally their language is somewhat closer to Bulgarian than to Serbian...but language does not make self-identity..
sure, but issue is that it is not really clear whether ancient Macedonians are really Greeks, as there are clues that they were not... and if they were not Greeks, than there is no reason for Greece to claim name Macedonia, is there? By all means if there are clues please post them! because all historical written and archeaological evidence points to them being Hellenic peoples. Hellenic people, or the contemporary termenology greeks, are a cultrual grouping, an ethos, rather than a ethnic identity. "Finally, Krste Misirkov, who had clearly developed a strong sense of his own personal national identity as a macedonian and who outspekenly and umambiguously called for macedonian linguistic and national separatism, achnowledged that a macedonian national identity was a relatively recent historical developemtn. In On Macedonian Matters, published in 1903, Misirkov, referring to himself and other slavs of macedonia in the first person plural, admits repeatedly that "our fathers, grandfathers, and great-grandfathers have always been called bulgarian" and that "in the past we have even called ouselves bulgarians" He describes "the emergence of the macedonians as a seperate slav people as a "perfectly normal historical process which is quite in keeping with the process by which the bulgarian, croatian and serbian peoples emerged from the south slav group"
"The political and military leaders of the slavs of macedonia at teh turn of the century seem not to have heard Misirkov's call for a separate macedonian national identity; they continued to identify themselves in a national sense as bulgarians rather than macedonians. The political goals of the internal macedonian Revolutionary organization (VMRO) were the liberation of macedonia from the Ottoman Empire, and the establishment of an autonomous Macedonia, but VMRO's leadership was challenged by the formation of the supreme macedonian comittee in Sofia, whose ultimate foal was the annexation of macedonian by Bulgaria. Inspite of these political differences, both groups, including those who advocated an independent macedonian state and opposed the idea of a greater bulgaria, never seem to have doubted "the predominantly bulgarian character of the population of Macedonia". Even Gotse Delchev, the famous Macedonian revolutionary leader, whose nom de guerre was Ahil (achilles), refers to "the slavs of macadonia as 'Bulgarians' in an offhanded manner without seeming to indicate that such a designation was a point of contention". In his correspondence Gotse Delchev often states clearly and simply "we are bulgarians". I kept to the point when references sources to use authors that are not Greeks or slav-macedonians, for we know they are usually filled with propaganda in one way or another. Now I couldn't care less what they called themselves, but they cannot monopolize the macedonian name and try to tear it apart from its hellenic past. Greeks in the province of greece often call themselves macedonian, I have relatives from that area that moved 40 years ago to canada I talk to tell me they never heard anyone call themselves macedonian as a separate national identity from Greeks. Ancient greek politics were as confusing as politics are today :) The macedons did end up participating in the olympics later on. I understand the idea that before they were hellenized they might of been something else, and probably were, but the macedonian character was born out of them being hellenized, a baptism as you will. As soon as you try to take away the greek character they stop being macedonian, and revert to that 'something else'. I don't mind debating this, but you have to understand that the current political "name dispute" between Greece adn FYROM started from the balkan wars and not from classical greece. Ancient greek politics were as confusing as politics are today :) The macedons did end up participating in the olympics later on. I understand the idea that before they were hellenized they might of been something else, and probably were, but the macedonian character was born out of them being hellenized, a baptism as you will. As soon as you try to take away the greek character they stop being macedonian. In my humble opinion, I don't care if they call themselves macedonians, it just bothers me when I hear things like macedonians have nothing to do with greeks, they were never hellenic, just these nationalistic rhetoric. Sometimes people just have to face the facts of history, no matter how uncomforting they are. I think for most greeks, to answer your question, its the latter of the two. I want to see this stupid conflict over with, I think relations between greece and FYROM will improve greatly when they come to a compromise. This whole thing is rather embarassing to have gotten this far. That was a good idea. Well done. I don't want this to cause the thread to go off-topic, but in light of the Bulgarians being discussed in this picture, I thought that some information on the origins of that group should be added. The region in which Bulgaria sits has been inhabited by many peoples. The ones that were there prior to the arrival of the Huns I will leave for discussion. After the German uprising, in which the Gepids assumed leadership, inflicted a crushing defeat on the Huns, the remnants of these people left most of their possessions and settled in modern-day Bulgaria. The empire had fallen apart both by this battle and the earlier death of Attila. He had too many sons who fought against each other. These groups, one of which I can remember was the Sabrians, along with two others eventually came to be called Bulgars and ruled this area. This nation became slavicized following the Slavic migrations and lost its connection with the Hunnish language etc. It is today rightly considered a Slavic country. The history of Bulgaria and its Empire is well known. One thing that must be remembered is that, if the Bulgarians are to be included in a discussion on whom the Macedonians of old were, the Bulgarians themselves have a very complex origin. Consequently, there can be no simple answer in drawing a connection between Bulgarians and Macedonians unless we specify Modern day Macedonians. Haplogroups of todays Macedonians are similar Serbian. Ok in Serbia is more strongly expressed I (nearly 48%) while in Macedonia E (over 24%) is a stronger than in Serbia but this is probably because of the large Albanian minority, which accounts for 25% of the population in that country. Nearly many Serbs once spoke the language very similar to today's standard Macedonian, and many Macedonians spoke language very similar todays Serbian, just standardization two languages has made to similar forms slowly forget. If someone really studied non-political background is likely to determine the current population of the country whose official name of FYROM is actually originating from Serbs, not Bulgarian, but in my opinion, people can identify themselves as they wish, only Bulgarians have no right to be claim to. Personally I regret that there is a conflict with Greece, and I think it's partly political, and that the Macedonian leadership to be more flexible, but it is my individual opinion, I like Skoplje and other places and often I was there. but in my opinion, people can identify themselves as they wish, only Bulgarians have no right to be claim to. I would agree with this. I had noted a number of references about Bulgarians in this case and thought that some of it should be addressed. but does that state makes Dardanians Makedonians????????? NO WAY, Before kossyfo war, Kossyfo was in Yugoslavia, But WAS YUGOSLAVIA A NATION?????? today Basques are in Spain BUT ARE THEY CASTIGLIANNI???? WHEN INDIA WAS UNDER BRITISH EMPIRE WHERE INDIANS BRITISH? so today Bulgarian people living in Skopje are they makedonians cause a Roman officer named a territory Makedonia???? i am a mogol invader to korea, and i claim i am chinese, !!!!!!!!! Ancient Macedonians were in fact Greeks. They spoke it, lived it, and we can find no ethnic difference between them and other Greeks. I believe that they were a branch of Dorians, a people who also were viewed in a not-so-great light when they threw out the Achaeans long before. There possibly may have been some admixture from some others peoples but I think that Dorian Greeks were the majority. It was not uncommon for some elitist Athenians to pretend to have difficulty distinguishing Macedonians from other Greeks, but it is more than safe so say that they knew better and did this to try to minimize Macedonian influence in Greece, which rapidly gained speed. Slavs moved into the Balkans after the East and West Goths migrated to their respective destinations. After the depopulation of certain areas in the Balkans from those conflicts (and subsequent Avar destruction later) the time was ripe for a new and vigorous people to move in. We call these southern Slavs. The Slavs reach the Balkans in their migration by late fifth to sixth century CE. I hold that is acceptable for some of these people to refer to themselves as Macedonians. The problem occurs if they lay claim to the achievements of ancient Macedonians. It is common to refer to those who now live in Rome as Romans, even though few can say with certainty that their families go back in that city to the days of the Roman republic. We would make no effort to sort out those who moved in last year or in 1850 and tell them that they cannot be called Romans. We just know that the terms mean different things for different time periods. Apache lived in texas, IS ANYBODY WHITE AN APACHE? since you live in colorado? ARE YOU A NAVAHO? NEW MEXICO RESIDENTS ARE THEY MEXICANS? DOES AN APACHE ALLOW YOU TO CLAIM THAT YOU ARE THE APACHE? AND JERONYMO WAS YOUR FATHER??? or if you migrate from spain to USA AND THEN Nevada you became a Navaho???? the one lives in AmERIcA is HE AN INDIAN (from india) BECAUSE COLOMBUS NAME IT LIKE THIS?????? 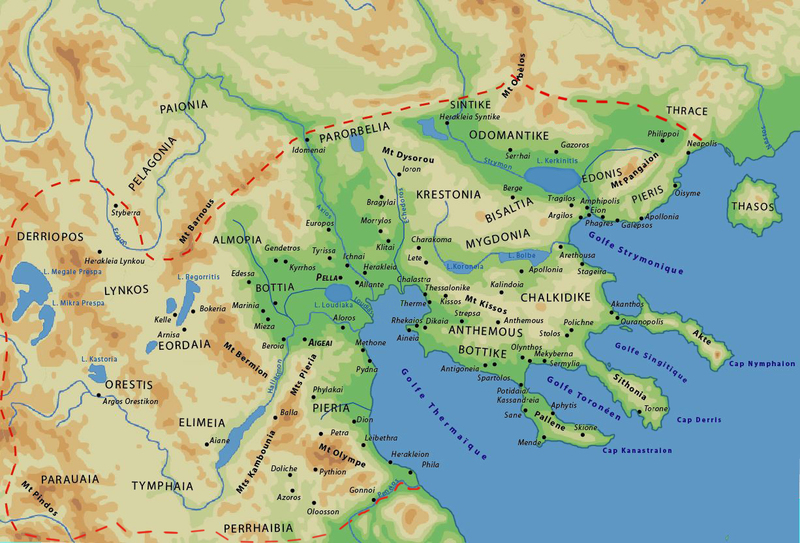 if i put a map of Big MAKEDONIA-GREECE that proves that syria was greek ones does that make syria greek? what does that mean? israelis are palestinians? like bosna and bagna luka, do you believe in the future they dont fight? Iapetoc, I think that you may have misunderstood my position. To summarize it as briefly as possible, I differentiate between ancient/classical Macedonians and Modern-day Macedonians. I believe that ancient Macedonians were mostly Dorian Greeks. I would say that modern-day Macedonians are primarily of Slavic descent. Both groups had languages and culture corresponding to their respective group. My point was that it does not have to be a problem if people from Macedonia today using that name as long as they do not also claim to be the same as ancient Macedonians. The region called Calabria in Italy has been in two different locations in that country in ancient and modern day. The region referred to as Macedonia today is much closer to that of ancient Macedonia, if not overlapping it. YOU HAVE JUST MAKE ME A SLAV. YOU DON'T UNDERSTAND, HOW YOU NAME MAKEDONIAN WHEN ANOTHER MAKEDONIAN EXISTS? IS IT OK WITH YOU???? the balkan wars lasted from 1904-1916. IS THE ONE WHO LIVED IN MANHATTAN A LEPANE INDIAN???? DOES THAT MAKE YOU A MANTAES or a NARATICONCK????? But did they took the nationality of locals? THEN WHY I WILL GIVE MY NATIONALITY TO ANOTHER NATION??? I did not make you to be anything. The thread was created to provide a place where the information and conclusions can be dicussed. It was not created so that all will agree 100% with any particular person. I don't what else I am supposed to say. This thread will contain posts from many individuals who disagree with you on far more points of this issue than I do. The only point of mine with which you seem to have a problem is that I allow the name Macedonian to indicate two different things for two different eras. I still dont understanded what the fyromians will earn by that? BESIDES EVERY BODY KNOWS THAT THEY ARE FAKE MAKEDONIANS. and what language will have the state that fyromians claim? and only a today mixed bulgarian dialect? which will be the prime minister? a Fyrom or a Greek? which will the national anthem? the greek makedonian or the fyrom one? what are you trying to do people, a new 2 lingua switzerland in balkans? or a state like belgium? Last edited by iapetoc; 20-01-11 at 20:01. I will not keep stating my point over and over. The "all or none" method of debate does not invite discussion or encourage others to join in. At some point you are going to want to defer or concede to some points made by others, especially when doing so does not hurt the substance of your own argument. I know that nothing I mentioned would make those that have opposed you here happy with me, so I don't know why you need to be so upset by mere peripheral points. I agree that there is a conflict of definition that should fall out in favor of the Greek Macedonian region. But is this really as important an issue as people are making it? Still, the area seem to be part of historic Macedonia, and they identify themselves as Macedonians which seem to be accepted by most of the world. Would Upper Macedonia be a better name? Whatever one does they will still call themselves Macedonian. It can be twisted and turned and somehow everyone in this naming conflict is right one way or another. Why not accept these people as Macedonian by geography.